Using the My Rewards™ Gold Debit Card for everyday purchases can be very rewarding! Now, it's even easier to earn more valuable items in your rewards program. Each purchase you make with the My Rewards™ Gold Debit Card, will earn you 2 points per $100 spent. Remember, 100 points is all it takes to get a gift at the first level! You may redeem right away or save your points for bigger, better rewards in the future. To view all the available rewards, log in or create an account at www.summitrewards.org and click "Rewards". Misplace your card? Get a replacement quickly and easily by calling (855) 887-8844. If you have a Gold or Platinum Debit Card, log in to your account at www.summitrewards.org and click "Shop Online" and "Shop Online Settings". If you have a Gold or Platinum Debit Card, log in to your account at www.summitrewards.org and click "Shop Online". 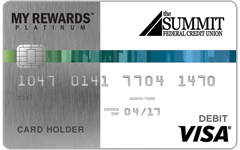 If you have a Gold or Platinum Debit Card, log in to your account at www.summitrewards.org and click "My Rewards Card" and "My Area Deals". To request assistance, please call 855-887-8844. If you have a Gold or Platinum Debit Card, log in to your account at www.summitrewards.org and click "My Rewards Card" and "Rx Savings"
To request assistance, please call (855) 887-8844. The My Rewards™ Gold Debit Card provides you with an extended warranty for eligible purchases (up to $10,000). This warranty doubles the original U.S. manufacturer warranty and any purchased warranty up to a maximum of 12 months. If you have a My Rewards Debit Card, sign in to your account at www.summitrewards.org and click "My Rewards Card" and "Hotel/Car Discount Codes". Using the My Rewards™ Platinum Debit Card for everyday purchases can be very rewarding! Now, it's even easier to earn more valuable items in your rewards program. Each purchase you make with the My Rewards™ Platinum Debit Card, will earn you three points per $100 spent. Remember, 100 points is all it takes to get a gift at the first level! You may redeem right away or save your points for bigger, better rewards in the future. If you have a Gold or Platinum Debit Card, log in to your account at www.summitrewards.org and click "My Rewards Card" and Rx Savings"
The My Rewards™ Platinum Debit Card provides you with an extended warranty for eligible purchases (up to $10,000). This warranty doubles the original U.S. manufacturer warranty and any purchased warranty up to a maximum of 12 months. My Rewards™ Platinum Debit Card holders may be eligible to receive reimbursement (up to $1,000) for eligible items that are damaged or stolen within 90 days of purchase. 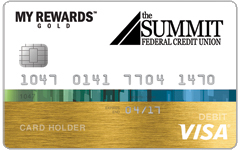 If you have a Gold or Platinum Debit Card, log in to your account at www.summitrewards.org and click "Rewards". If you already have a www.summitrewards.org account, please log in and select Card Settings from the My Rewards Card menu.